Growth in average income in Mumbai was recorded at 20.4 per cent while home prices increased by 8 per cent in 2014 -18. 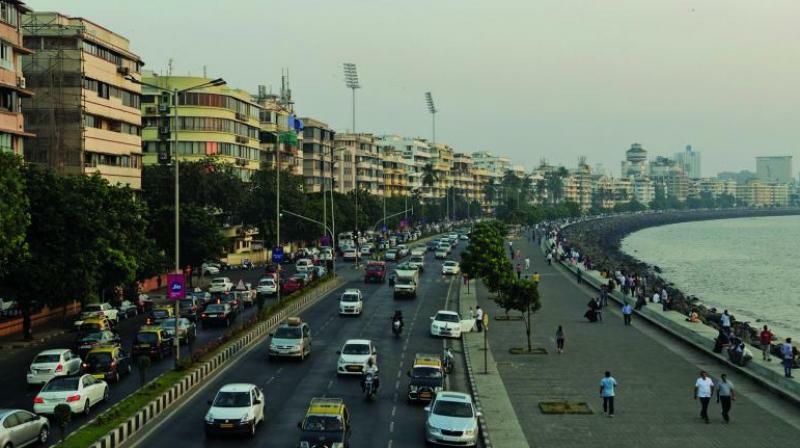 Mumbai: Maximum city Mumbai has recorded the third highest growth in annual household incomes over a five-year period (2014 – 2018) according to Knight Frank’s global report, Urban Futures. The city recorded a rise of 20.4 per cent in annual household incomes in the period of study. The growth in housing prices in the same period in Mumbai has been estimated at 8 per cent. San Francisco, USA saw the highest rise in annual income at 25 per cent in the five-year period while Amsterdam (Netherlands) at 63.6 per cent recorded the highest rise in housing prices in 2014 – 18. The report evaluates 32 cities across the world to understand the difference between house prices and income and estimates the gap to be USD 740 billion in 2018. Despite having most expensive real estate market in India, Mumbai emerged among the more affordable cities amongst its global peers. Mumbai has seen real household income growth outpace real house price growth by 12.4 per cent, indicating an improvement in affordability. The real house prices in comparison have grown at a much slower pace of 8 per cent while the real disposable household income growth was over 20.4 per cent in the five-year period ending 2018. The affordability in the city has improved on account of reduced size of housing units with largely stable prices. Consistent reduction in apartment sizes has also lowered the average ticket price for Mumbai. It is estimated that on an average, newly launched homes are smaller by 25 per cent in 2014 - 18. Maximum launches, especially in the last two years (2017 and 2018) have been in the affordable and mid ranged segment with ticket prices not exceeding Rs 75 Lakhs. Mumbai along with Moscow, Singapore and Paris saw their Average Real Income grow faster than real house prices. Indian government’s initiatives such as Credit-Linked Subsidy Scheme (CLSS), Pradhan Mantri Awas Yojana (PMAY), a scheme that aims to ensure 20 million affordable homes by 2022 have worked well. Mumbai is one of India’s most expensive housing markets but has seen the affordability of homes significantly increase in the last few years. It is now estimated that a house in Mumbai will cost approximately 7 times the annual household income Against 11 times in 2014. “Mumbai’s residential housing shortage has been a reason for concern for most urban development agencies including the government. Similar to other global cities Mumbai adds many new settlers every year making it a difficult place to find housing. However, in comparison to others, Mumbai is distinctly more affordable,” said Shishir Baijal, Chairman and Managing Director, Knight Frank India. “The general growth in the economy coupled with increased incomes and reduction in property prices have ensured a more balanced housing situation. Mumbai has seen a drop of close to 7 per cent in the ticket price of new launch in 2018. Further, with the recent announcement on reducing GST on under construction projects, the effective payout by the buyers is expected to reduce up to 7 per cent,” he added. As part of the Urban Futures report, Knight Frank has launched its Global Affordability Monitor, which analyses affordability across 32 cities. It takes into consideration three key measures – house price to income ratio, rent as a proportion of income and real house price growth compared to real income growth. Across the 32 cities, there was an average five-year real house price growth of 24 per cent, while average real income grew by only 8 per cent over the same period. Overall, New York saw its income growth exceed real house price growth by 3 per cent while Moscow, Singapore, Mumbai and Paris also saw their average real income over the last five years grow faster than real house prices. Moscow saw the largest difference where real income growth outpaced real house price growth by 22 per cent. Floor space regulations: If the Indian government were to lift floor space regulations in Mumbai, developers could build vertically, alleviating the pressure for space in the city, whilst increasing supply.